Ready to have your jeans go neon? Obviously. We’re on this trend like white on rice… rather color on denim. Is it a flashback to the era of bubble gum and friendship bracelets? Maybe, but neon denim is becoming increasingly popular, and just about all the brands we love to follow have their own take on this trend. Check out some of our favorites — all under $100! 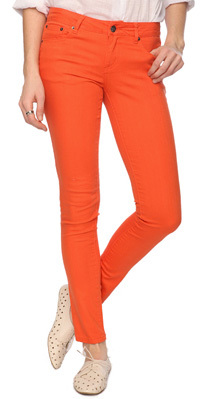 1 – Forever21 Vibrant Skinny Jeans $25 are available in seven colors — We love the yellow the best, though. Why not take a break from your classic skinny jean by adding a pop of color? 2 – Hudson Jeans Skinny Stretch Jeans $100 available in two colors — The days of regal yore will tell you purple is the color of passion — and of royalty. Obviously it should be the color of our derriere as well! 3 – Old Navy Colored Slim Flare Jeans $34 available in two colors — In a market dominated by skinny jeans, this is ideal for those of us who prefer a bit of flare with our fit. 4 – Charlotte Russe Faded Raspberry Skinny Jean $30 — There may be nothing hotter than a bright pink skinny jean. Get the right fit, and you’ll be the talk of any party. 5 – STS Blue Frayed Cuff Denim Shorts $44 — Our favorite aspect of these shorts? Behold the awesome worn-in vintage appeal and frayed hems!